Auburn and Alabama both have their A-Day Spring Football games tomorrow. It seems like yesterday that we were watching the National Championship Game. I can't believe Spring football is already here. That means one thing, college football will be here before you know it! Whoo hoo! 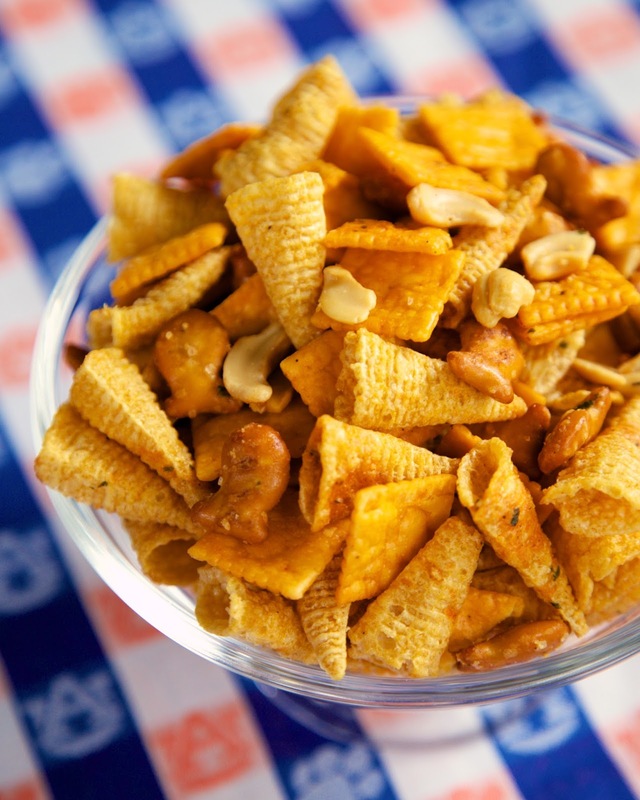 This Buffalo Ranch Snack Mix is perfect for tailgating before the games tomorrow. It is super easy to make and tastes amazing. The best part is there is NO BAKING required! The snack mix isn't spicy. It just has the flavor of buffalo sauce. Feel free to add more buffalo sauce to the mixture if you want more of a kick. This snack mix is highly addictive. I've made this several times and I can't control myself around it. I end up giving most of it away so I don't eat it all myself. If you aren't into football, this would be a great snack for summer road trips, the beach, or girls night. Check out our Tailgating board on Pinterest! 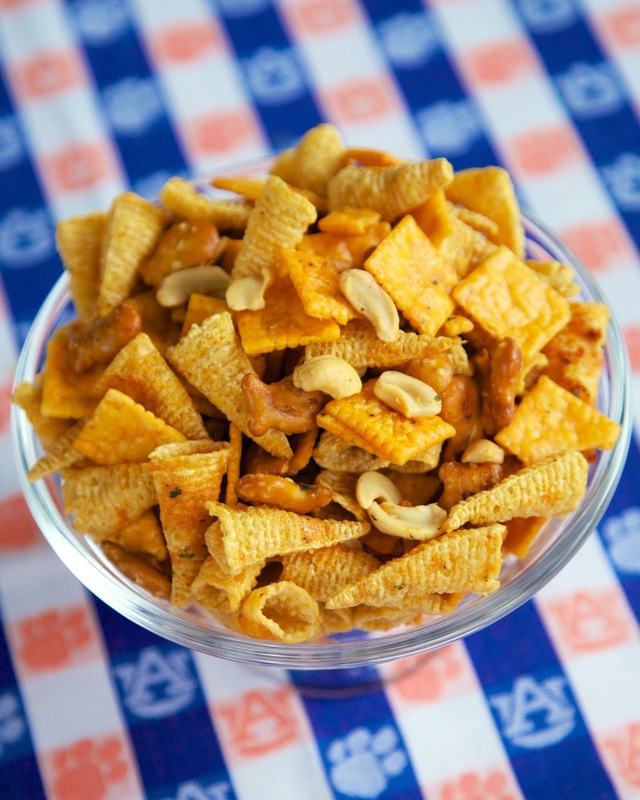 In the largest bowl you have (or two large bowls), combine bugles, pretzels, Cheez-It crackers and cashews. Whisk together Ranch mix, buffalo sauce and canola oil. Pour oil mixture over bugle mix and toss thoroughly to combine. I love that you give most of it away...that means I get to enjoy it (along with my co-workers, who scarf this mix down)! YUM! Fantastic! I threw in two packages of crumbled Ramen noodles that I roasted at 350 F for about 10 minutes. This snack mix is addicting. Thanks for renewing my love affair with Bugles! Thanks for the reply. I did find it dries out just fine :) I have made this several times and it is very addictive! I doubled the buffalo sauce for gifts for some people that love the spicier taste, Thanks ever so much for sharing this easy recipe! Is it possible to whisk the oil, sauce and seasoning too much? The oil separated and the consistency was gummy and made it difficult to pour evenly over the bugle mix. The result was some clumps of mix that were soggy - but through it all we are devouring it and it is still delicious! !